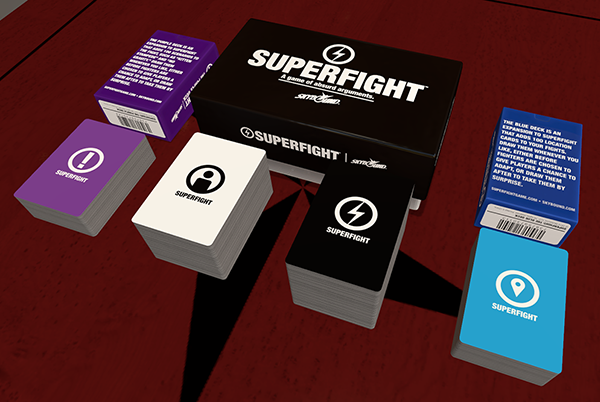 6/5/15 – Update v5.0 Tabletop Simulator Officially Launches With Superfight DLC! We did it! We’ve come so far in just a little over a year and now we’ve completed Early Access and are officially released! Thank you to everyone who supported us along the way from the Kickstarter days to now. Without your support, we wouldn’t be where we are today. We’ve proven that Early Access does work and it really pushed us to make Tabletop Simulator better than ever. The fun doesn’t stop here however, we’ve got a lot more in store for you and we’ll be continuing the development to ensure Tabletop Simulator is top notch! This also marks the exciting release of our first DLC with Skybound’s Superfight, a hilarious card game in which players use cards to create ridiculous characters, and then argue about who would win in a fight! You can check out the store page for Superfight here. On that note, let’s go over exactly what’s new in this release update v5.0 and let the party begin! Our first DLC, Superfight is now available and can be picked up for $4.99. Superfight is the viral card game sensation in which players use cards to create ridiculous characters, and then argue about who would win in a fight. The DLC will include the 500 card core deck, the blue deck, and the purple deck. Blue Deck – 100 location cards that give settings for the fights ranging from space stations, to oceans of gelatin, to the inside of a volcano. Purple Deck – 100 scenario cards that add hazards and conditions to the fights such as kitten stampedes, land mines, and opposite day. 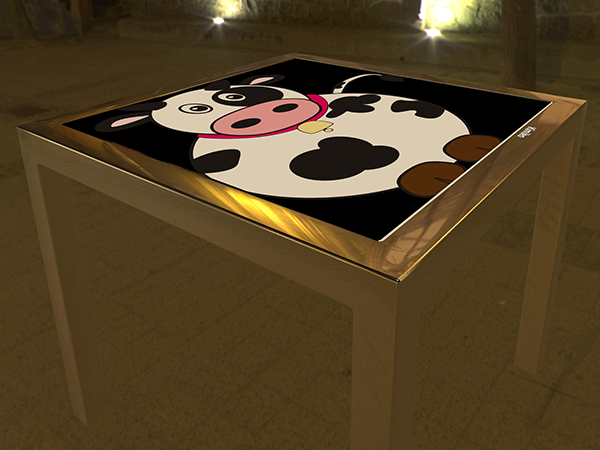 Custom square table added with a chrome body. Supports importing a custom image onto its surface. Seats up to 8 players – two on each side. Added in a 2D pointer when in the main menu or spectator. If you wish to always use a 2D pointer you can change it in Configuration -> Pointer menu. The 2D pointer is a hardware pointer so it isn’t tied to the fps the game is running at (Great for lower end systems). 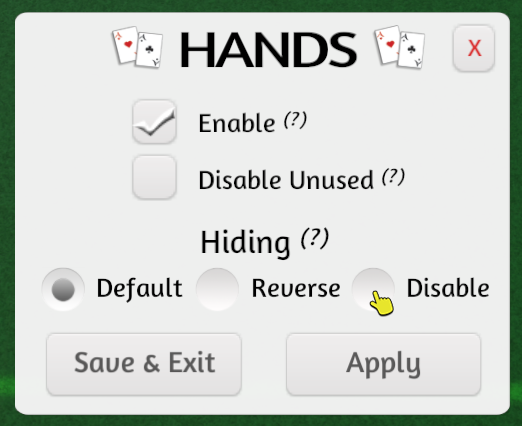 New hands menu added which lets you control how card hands function. You can now disable hands for colors that are not in use to free up more space on the table. Hiding can also be configured with reverse and disable hiding option. Enable hands toggle has been moved from the host option menu to this new menu. Hands settings are saved to each save state just like the grid menu. Fixed being able to deal to disabled hands causing strange problem. Improved the responsiveness of moving objects around. Improved the accuracy of joints by increasing the physics solver iteration. Rebalanced the mass on all objects to make physics interactions more believable. Reduced the chance of accidentally shuffling decks or bags. Moving around really heavy or really light objects will no longer cause erratic behavior. Fixed strange physics after scaling objects larger or smaller. Greatly optimized card search for use with large decks. Fixed searching messing up the order of the cards. Added a queue number to the custom model import menu. Added a green highlight around the object that the custom menu is targeting. Improved error handling of the custom objects when files cannot be retrieved. The URL of a failed to load custom object will no longer be deleted from the UI. Added back in select all text on input fields of URLs. Revamped the custom menus importing for images and decks. Fixed potential issues when custom colliders couldn’t be generated. Fixed a bug with being unable to close the Custom Model import menu. Bags can now be placed within bags (yo dawg I heard you liked bags). Fixed objects being duplicated when dropped on multiple nearby bags. Optimized many fps spike causing issues. Post AA has been removed due to performance issues and texture blurring (MSAA still available). At medium/default graphics, integrated graphics can see up to double previous fps (25 fps to 45 fps on test system). Graphics presets changed so that full textures is only disabled on very low settings. Added tooltips for Lock, Grid, and Persistent in the contextual menu. Lightened the bag to allow brighter color tints to display properly. Added error text for spectators trying to interact with objects. Holding CTRL while right clicking objects will multi-select. Improved the position of the push collider to match up better with the pointers. Coins can now be flicked by using the key to flip while holding and then releasing it. Cleaned up the position of many UI elements on menus. Improved the spawn position of objects in the RPG base game. Reduced the chance objects will be cut off the screen when alt zooming. Grouping now works on held objects as well as selected. Added tooltip for all the icons next to players names. Increased the height of the hidden area collider to reduce chance of accidentally exposes objects. Fixed team voice chat not working properly. Fixed issue with sorting the Workshop/Load menu sometimes stopping to work. Fixed objects in the chest menu colliding with things on the table. Fixed a bug with rocks and trees contextual menu not working. Fixed the mass of certain objects from being reset after picking them up and reporting wrong. Fixed removing a chip from a locked stacked being locked as well. Fixed issue with Workshop crashing the Steam client. Fixed a bug with expand save that wasn’t removing duplicates. Fixed stacking cards with identical names and/or descriptions not applying to deck. Fixed issues with hidden areas sometimes not hiding locked objects. Fixed flickering hands and hidden areas highlighting when fps was greater than 75.